Product information "HAIX Fire Hero Xtreme, FS"
These leather firefighter boots for men have highly slip resistant soles that allow you to get into the action even if it's on water, ice, or snow. Together with the honeycomb tread pattern and yellow suction cups, the boots offer excellent traction on slick and wet surfaces. Climbing up ladder rungs can be the norm during fire operations and with ladder bar treads in the joint area, you can focus better on the emergency knowing your leather firefighter boots for men have added stability. The polyurethane foam is injected into the sole cavity, offers shock absorption and phenomenal heat and cold insulation. Because as a firefighter, you never know where you're going to be and how bad the situation will be. And because these HAIX® Factory Seconds fire boots' sole is self-cleaning, oil and fuel resistant, and non-chalky, it requires minimal maintenance. The added benefit of a built in boot jack at the back, makes getting these HAIX® Factory Seconds fire boots off as easy as 1-2-3. The HAIX® Ankle Flex System in these leather firefighter boots for men, and their interior elastic components, creates snug fit that will support your feet and ankles, so you don’t have to worry about twisting your ankle when running or jumping off the fire truck. The integrated flex zones that surround the ankle ensures you have flexibility and freedom of movement when kneeling or driving. The Ankle Flex System enables the boot to adjust to different foot, ankle, and heel shapes for a more custom fit. The added Ankle Protector helps to prevent ankle injuries from sudden blows. These HAIX® Factory Seconds fire boots are European made and built with only quality European leather and unique HAIX® features. And with its CROSSTECH® inner liner you not only get a boot that's waterproof, but you get added protection from chemicals and bloodborne pathogens. The HAIX® Climate System that comes with these HAIX® Factory Seconds fire boots ensures that your feet stay at a comfortable temperature no matter what. It keeps feet cooler during warmer temperatures and warmer during colder temperatures. Don't worry about having to stand in the hot sun all day either. The HAIX® Sun Reflect leather protects the boot by reflecting direct sunlight so your feet don't get too hot even on the hottest of days. The larger bootstraps are strategically placed below the topline of these HAIX® Factory Seconds fire boots in order to protect the calf from the rubbing you can experience with other manufacturer’s longer bootstraps. And with these leather firefighter boots for mens' padded shin protection, you can lean on ladder rungs all day long and barrel through low obstacles without any worry of injury. NFPA certified for structural firefighting, our HAIX® Factory Seconds Fire Hero Xtreme is the cream of the crop in fire boots; often imitated, but never duplicated. HAIX® Factory Seconds do not come with warranty repair. To be eligible for our repair and replacement warranty, please see our factory firsts HAIX Fire Hero Xtreme. Related links to "HAIX Fire Hero Xtreme, FS"
Our comment on "HAIX Fire Hero Xtreme, FS"
Customer reviews for "HAIX Fire Hero Xtreme, FS"
I have had these boots for 8 years now. They are very comfortable they fit like a glove. I just ordered a new pair. They just started leaking but I will wear this boots in till I retire. Very good product. We appreciate you taking the time to review the Fire Hero Xtreme, FS. We are pleased that these boots have been the most comfortable you've ever worn on the job and that they have served you well so far. We appreciate you recommending these boots to your coworkers. Thanks for being a loyal HAIX customer! I bought these boots on the factory seconds site and when I received them, I looked at each one trying to find the "flaw". I couldn't find one nor could any of the other guys at the station. Comfortable and durable and worth every penny spent on them! Excellent boots and would recommend them to anyone! Thanks for taking the time to review the Fire Hero Xtreme, FS. We are happy to hear that you found these boots to be comfortable, durable and worth the price. Many of our other customers have also said that they did not find the "flaw" in the Factory Seconds either. It may be something so small that it is not even noticeable. We appreciate your recommendation and your loyalty to the HAIX brand. When I received the boot I thoughly inspected and could find nothing wrong but one small scuff on the heel. Very comfortable and worth the savings!!! We appreciate your feedback on the Fire Hero Xtreme, FS. We are happy to hear that the boots are comfortable and that you are satisfied with your purchase. We hope these boots will continue to serve you well in the future. 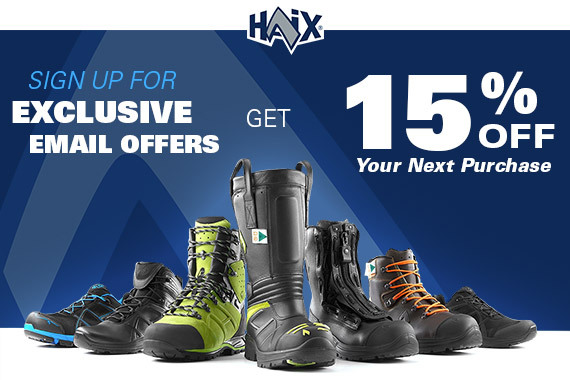 I have size 10.5 Haix Airpower station boots and read on the Haix site that you should order your structure boots one half size smaller, so I ordered FS size 10 mediums. They were too tight for me so I ended up ordering 10.5 mediums and they fit perfect. The boots are awesome and required very little break in (and that was mostly getting them to come off easier). I was unable to tell what made them FS. Definitely recommend them. Had a pair of rubbers and a pair of Pro-Warringtons previously. I prefer these Haix over both. Thank you for taking the time to give us feedback on the Fire Hero Xtreme FS. We are glad that you got your correct size and found them to be comfortable out of the box. We appreciate your service and for being a loyal customer. We have been wearing the Fire Hunter products in our department for 10 years without complaint. We have purchased the Fire Hunter Extreme FS for all our personnel. I am certain we will continue to be satisfied with Haix boots. First of all, we appreciate your loyalty to HAIX and our Fire Hunter Boots. We are happy to hear that the boots have served your department well over the past 10 years. Thank you for all you do. Stay safe out there! I picked these up Black Friday as my issued rubber boots were becoming degraded. Currently, they're my back up set,as most of us know, having a good back up set makes it easier to switch to them after a fire. I emphasize this point as after the first long call and switching gear, having a very comfortable pair of boots to get into for the next call makes a world of difference on your feet. We are happy to hear that you find the Fire Hero Xtreme, FS to be comfortable when on active duty and a nice compliment to your other boots. We hope they continue to serve you well in the future and even become your go-to boot! Thanks for your comments, we appreciate it. Bought these as my department only issues the uncomfortable rubber boots and they only authorize four other boot models, two of which are produced by Haix, for private purchase. These feel good once on but they are a little tight while donning and doffing (size 10.5 wide). Although they seem to get a little easier to put on and take off every time they are worn so they may require a slight break-in period. These boots were offered as factory seconds at a reduced price but I honestly don't know why they are considered seconds as I can't find a single flaw or even a misplaced stitch. Thank you for taking the time to give us feedback on the Fire Hero Xtreme, FS. Our structural fire boots can take a little longer to break in, due to the thick, full grain leather used throughout which could have had an effect on getting the boot off an on. We hope they serve you well in the future. Stay safe out there. Had these boots for 5 years now and they are still great. Highly recommended! We are so happy to hear that the Fire Hero Xtreme, FS have served you well over the past five years and we hope that will continue in the future. Thank you for being such a loyal customer and sharing your experience with us. Stay safe out there! I have been wearing them for awhile, feel great, can wear for hrs, I love them. We appreciate your feedback and are happy to hear that you love your Fire Hero Xtreme, FS. We hope you'll continue to be a loyal customer in the future. Have only had them a short time, been great so far. It's great to hear that your Fire Hero Extreme boots are working out well for you so far. We appreciate you taking the time to share your experience with us. Thank you for everything you do. Stay safe out there!